We have had personal experience with bedwetting in our home. I am excited to be able to offer some advice, and tell our story as part of this sponsored campaign from White Cloud Sleep Pants. 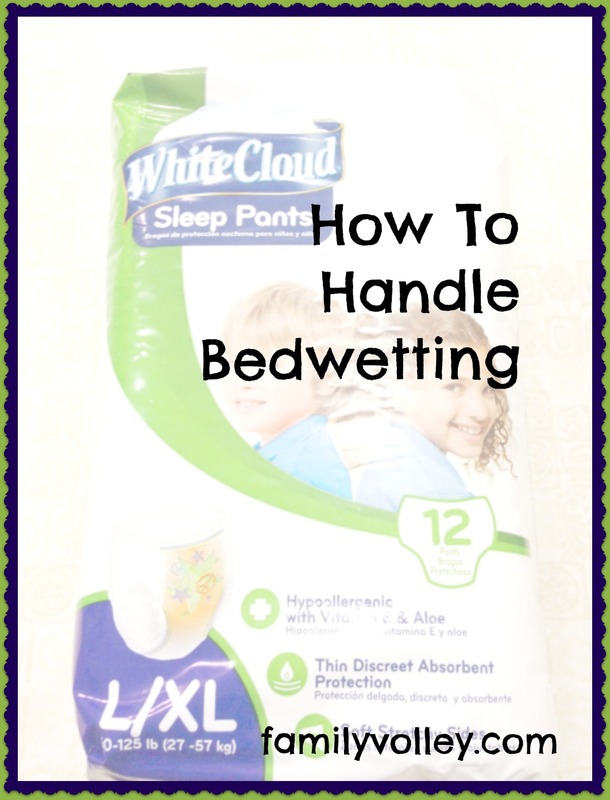 Bedwetting can be a really frustrating challenge to deal with. Especially when our children are a bit older and have been trained for years. Often times a child who has started school and has had dry pants for years, starts to wet the bed. As parents, we have no idea what to do. We might feel ashamed or even like we have failed. One of our children struggled with this for over a year. The emotional stress was exhausting, not to mention the extra laundry every day really began to take its toll. I went through a gamut of emotions, including blaming myself, and blaming him. At first, we wanted to respond with frustration, threats and consequences if the bed didn't stay dry. It was very hard to be patient. My husband and I would sit and talk every night about why it was happening, and what we needed to do to stop it. 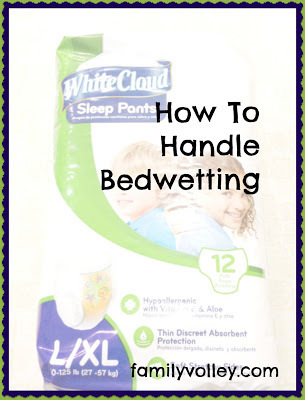 I knew the research behind bedwetting, and what I needed to do, but it didn't seem to make it any easier while it was happening in our own home. After it went on for quite some time, we made a visit to the doctor just to make sure it wasn't a medical condition. Everything checked out fine. We had to come to the understanding that our child was not wetting the bed on purpose. It was not their fault and they were not being lazy. It was just going to take time as their bladder control was taking a little longer for some reason. 2. Children have a sleep condition that makes them sleep so soundly, they don't wake to respond to their body prompts that they need to go. 3. Bladder control takes longer for some children than others. 4. A medical condition (although it is very rare that this is the cause). Bedwetting is fairly common. 10% of 6 year olds wet the bed. It is much more common in boys. Children usually grow out of it by the time they are 10. Luckily, that is what happened to our son. He eventually grew out of it. What can we do as parents to help our children? First and most important, we have to be patient. Really really patient. We shouldn't ever shame our children, or punish them for wetting the bed. No threatening or demeaning. It is important we stay positive and supportive. 1. Don't let your child drink a lot of fluids within two hours of bed. 2. Keep your child clear of caffeinated beverages. Caffeine is a natural diuretic. 3. Wake your child up and take them to the bathroom right before you go to bed. 5. Have them wear protective pants at night to help save the sheets and bedding. Some parents feel this is supporting the problem, but it isn't. It takes away the shame for your child, will save you laundry, and will allow your child to help themselves in the middle of the night when they wake up wet, and can then take care of the situation. The best brand we found was White Cloud Sleep Pants from Walmart. The price was reasonable, they looked like underwear, and they didn't leak. 6. Apply a special sensor in their bed, or on their pants that alerts them the second they start to get wet. The alarm will wake them so they can stop and go to the bathroom. 7. Keep track of how many nights in a row your child stays dry, BUT, if they have an accident, don't get mad. Just start keeping track again. Be careful with incentives. If children don't earn the incentive, it can make them feel like a failure. 8. Consider spending more one-on-one time with your child. Make it a point to strengthen your relationship and spend time together. This will also help ensure that your child isn't wetting the bed for attention. Above all other things, be patient. Think about how your child must feel, try to see and understand their perspective. They don't want to wet the bed. They don't want to disappoint you either. Be positive, uplifting and don't force, punish or demean them. For my husband and I, the patience took time. But we got there. We also simplified things. At first I was against any sort of "night time pants". But, after chatting with my mom about the situation, she suggested I stop worrying, get our child some sleep pants, and move on with things. She was exactly right. We tried a number of different brands and were happiest with WalMart's White Cloud Brand. The protection and price were the best. They helped make a tough situation, much easier. Do you have a child who wets the bed? Was it hard for you to be patient? I have a son that won't (can't) wear underwear. So his 3 years of bedwetting were especially hard because pull ups and training pants weren't an option. His sensory issues were so bad (are so bad) that he sleeps naked on the bottom half. I would put a pull up on and he would take it off, no matter the footsie pajamas with a safety pin or duct tape...he would get it off. Every night. For THREE years. I learned to have two layers of waterproofed mattress pads and sheets along with two blue hospital chux pads. It helped with the amount of laundry if not my frustration. Oh Goodness Emily, you had a very very long three years. We struggled in our house for a bit too, and the laundry brought so much frustration. It went from a physical task to a very mental and emotional task. I love that you dealt with it the way you did. I wish I would have just done that sooner, but I let the pride and stress and embarrassment keep me from making the tough situation easier. Thanks for sharing. I had no idea you had been dealing with that. How is your son doing now? Not just with the bedwetting. Sensor issues any better? Is he is school yet? We tried everything for my daughter's chronic bedwetting. Nothing worked. Finally I asked her pediatrician about it, hoping he could recommend a bedwetting alarm. Instead, he ordered a urine culture. Surprisingly, she had a mild urinary tract infection even though she had no symptoms beyond the bedwetting. A round of antibiotics cleared it up and she hasn't wet the bed since. Always check with your doctor to rule out an infection. I am so glad that you found the problem! We went through the doctor visit also, and the tests, but ours came up negative. The doctor mentioned that infection might never show visible signs. So glad you found what was bugging your daughter. Thanks so much for this post. My son just turned 7 and has had spurts of staying dry but keeps going back to wetting the bed... I think you're right and ill go back to buying some sleep pants (I used to, but I thought maybe they were a crutch), but I think I deserve a break from all that extra laundry that you mentioned:)) and also how it will help him to feel better about taking care of this issue rather than stripping the sheets off every morning. Thanks for sharing! My son is 15 and still wets the bed. We have taken him to the Dr and he has been on meds for almost a year now. He does not have a medical condition. The Dr has him on a fiber supplement and pills that help control his bladder. This has been a very frustrating issue and after years and years of hoping he would grow out of it, and he never did, we had to take this route. If he forgets to take the meds, even once, he wets the bed. My almost 15 yo son still wets the bed occasionally, as did his father, uncle & aunt. For him, it's genetic. We just kept night pull ups until it became a rare instance (now, maybe only once every couple months). No hoopla, and everyone gets more sleep. He's about to go on an extended youth trip with our church - I'm nervous and trying to develop a plan with him - wetting the bed in this instance would be devastating for him, but taking along "night pants" that would be in the hotel room he'll be sharing with other kids would also be an issue. I think we've decided on something more like Poise, that is less conspicuous to have with him, and could be more concealed if a wetting incident happens. This is about bed wetting alarm system. Bedwetting is a very common problem among kids though this problem may recur at anytime and at any age. It is mainly a nervous disorder in which a person.